Mission launches LX range of affordable speakers | What Hi-Fi? The LX-2 standmount and LX-3 floorstander models are the first to be unveiled and the first to be made under the guidance of Mission’s new design team. The speakers features a brand new 25mm soft dome tweeter which is coupled to one 130mm mid/bass driver in the LX-2s and two mid/bass drivers in the LX-3s. The drivers feature a cone that has been made from an “advanced fibre formulation”, which Mission claims offers improved stiffness and self-damping qualities. Mission has stuck to a time long tradition of placing the tweeter below the mid/bass driver in the LX-2 standmount speakers because it’s then lower than ear level, making the signal path length to the ear longer than that of the mid/bass driver. Mission says that because the tweeter dome extends out further than the mid/bass cone, then the difference in path lengths “helps to equalise the acoustic distance”. 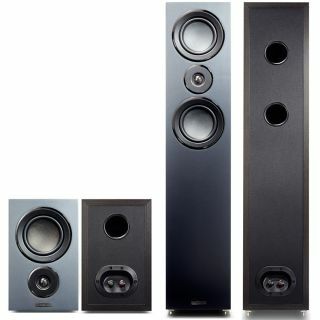 With the LX-3 floorstanders, the tweeter is placed between the drivers in a D’Appolito configuration. The LX-2 and LX-3 speakers will be available from late spring for £200 and £400 respectively. Three other models: the LX-1 standmounter, LX-4 and LX-5 floorstanding speakers and a centre channel are due in the summer. The LX-2 and LX-3 are on display at the Bristol Show which runs 26th-28th February. Drop by this weekend, and you can be amongst the first people in the UK to see and hear them in the flesh.